VMware has so far not been very succesful in public cloud. The company believed an IaaS cloudplatform able to support legacy applications would be a logical choice for many customers. However VMware vCloud Air build on vSphere is not succesful. Many customers selected Amazon or Azure to deploy new or current applications. Gartner moved vCloud Air from the visionaires quadrant to the niche players quadrant in its 2016 edition of the IaaS MQ. Mainly because of the lack of new features and services in the platform. VMware was not able to explain customers the unique selling point of their public IaaS platform well enough. The new strategy for VMware on cloud is enabling customers to use multiple clouds from established cloud providers like Amazon, Microsoft and IBM. VMware says to its customers: “We want to be your friend as you move to the public cloud. While few technical details are known at the moment, I try to erase all marketing from the announcements. Cross-Cloud Services (Cross-cloud Architecture ) is a cloud management platform offered as SaaS which will go into preview at VMworld 2016. The software allows customers to have a single pane of glass on multiple cloud platforms, offering IaaS and SaaS services. To tool makes it easier for IT to deploy, manage policies, have insight in costs, do networking over multiple clouds. One wrinkle here is that describing Cross-Cloud as a “product” is being kind. Gelsinger told The Register it only left the drawing board nine months ago and will start to deliver revenue in three to four years. It’s now going into limited private betas. As it is offered as SaaS, customers do not have to install anything on-premises. Cloud-Services can do discovery, cost analysis and monitoring. It can discover workloads (VMs) and well as applications. It can discover the tiers of an application. It can analyse the network traffic between internet and those tiers. It shows costs and can predict future costs. Cloud-Services is able to migrate and clone instances. The migration is basically a V2V conversion we know from VMware Converter. 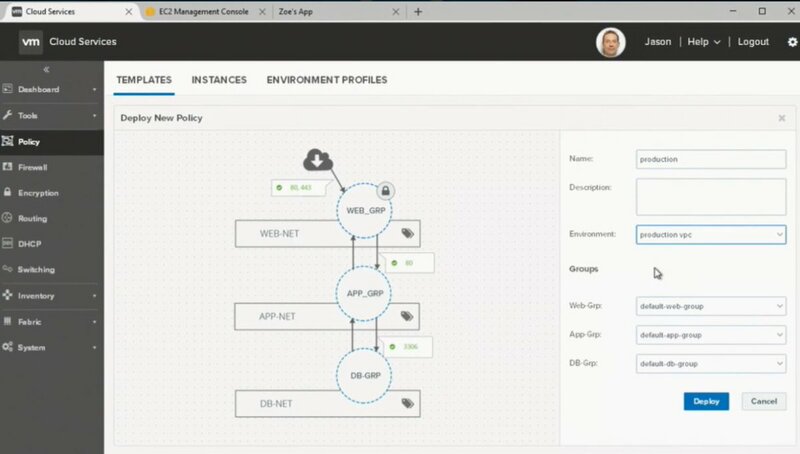 The migration feature of Cloud Services allows to tranfer data from instance from for example Amazon to Azure. One the initial replication is ready, a switchover can be done. It is a continous replication. This can take hours depending on bandwidth. The heart of Cloud Services is a SaaS implementation of VMware NSX. When a public cloud network on for instance Amazon needs to be managed using NSX, Cloud Services will start deploying NSX to your Amazon cloud. It does so by deploying the NSX gateway virtual appliance to your cloud platform. Once the NSX agents are installed on the instances, you are able to use NSX on public clouds just like on-premises. Cloud Foundation is a bundle of VMware vSphere, VSAN and NSX with additions like vRealize and the new SDDC Manager. Basically it is the turn-key solution of a Software Defined DataCenter (SDDC) available on-premises and in public cloud. It seems to have the same idea as Microsoft Azure Stack. It offers on-prem IaaS and PaaS services ready to run. The same services are offered by IBM in a public offering based on the same Cloud Foundation software. It will be rolled out to other public clouds later in the year. Raj Yavatkar of VMware has more details in his blog. VMware Cloud Foundations is available now. The on-premises turnkey variant is VxRack SDDC. The current example of a public cloud target is with IBM Softlayer. Bloomberg states VMware wants to target Nutanix with Cloud Foundation. At the moment I fail to understand this compare. vCloud Availability for vCloud Director is a software solution which enables service providers using VMware vSphere to offer a Disaster Recovery as a Service to their customer. Many organizations are looking into disaster recovery. The number of available solutions has grown enormous over the years. Think Veeam Cloud Connect, Microsoft Azure Site Recovery ,vCloud Air Disaster Recovery and Zerto. Zerto announced version 5.0 of its Virtual Replication product at VMworld 2016 which allows Azure as a target for replication. vCloud Availability seems an answer to Azure Site Recovery which allows VMware shops to replicate their virtual machines to an Azure datacenter. One of the benefits for Microsoft is that once customer applications run in Azure, they often stay in cloud. The result: a VMware customer moved away to Microsoft for public cloud. Another reason for vCloud Availability might be the limited adoption of vCloud Air DRaaS service. More information on vCloud Availability for vCloud Director here and here. VMware vCloud Air Hybrid Cloud Manager allows vSphere customers to extend their on-prem datacenter to VMware vCloud Air. 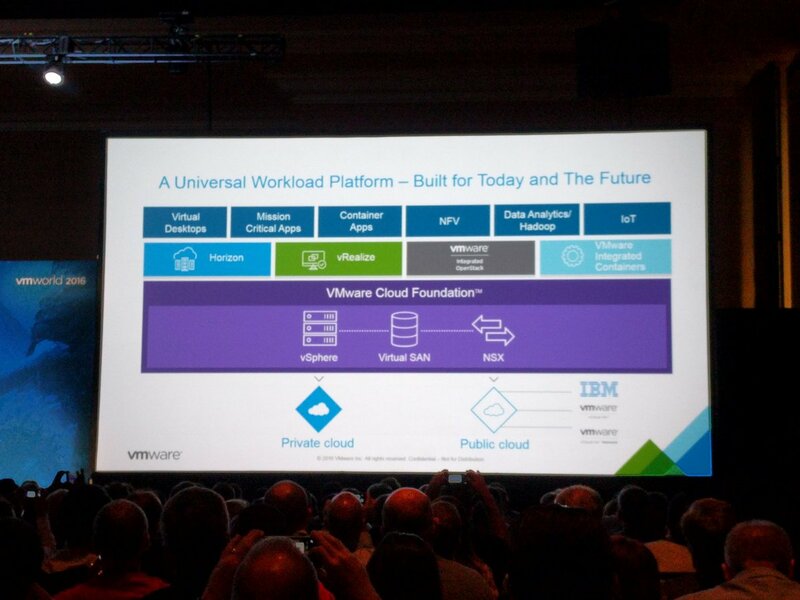 The new release announced at VMworld has added several major enhancements, including zero-downtime, bi-directional application migrations in and out of vCloud Air. This includes the migration of NSX security policies, providing simple migration of workloads to vCloud Air with no need for any network or security reconfiguration once the migration completes.